Supertortuga - Welcome to the world of Supertortuga! My favourite character in Arne Dahl's novels is without doubt Arto Söderstedt. Arne Dahl is the pen name used by Jan Arnald when writing his crime fiction novels. The writer was introduced to me by my father who gave me a book (I think it was "A Midsummer Night's Dream") and recommended me to read it. Since it was not the first book in the series, the different personalities of the Intercrime group (A-gruppen in Swedish) were already defined in the previous books, and I got to learn them better as I kept reading the earlier books. The novels circle around the Intercrime group and their work to solve crimes with international connections. The persons forming the Intercrime in the group are the same throughout the series, but their personalities change and evolve as they get older and are affected by their experiences. Each book is set around a plot which relates to real world problems, such as cyber crime, prostitution, organized crime, etc. While the story is often crude, it is narrated with a humorist touch. I always look forward to reading the books in the Intercrime and Opcop series, and I am happy there are several ones still unread. During today's evening walk, my dog suddenly became alert. Then I saw it. 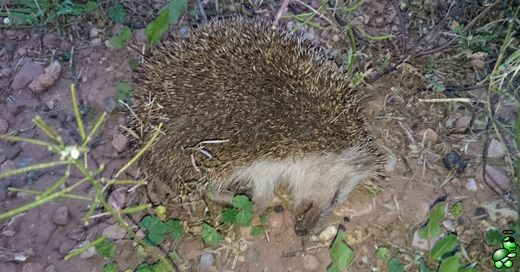 It was just lying there, the poor hedgehog was obviously dead, without any visible signs of a violent death. Was it an accident? Was it fate? Was it part of the masterplan of some greater almighty god? I don't know, but I think that this beautiful animal had become victim of eating the poison used in the orange plantation to keep the poblation of rats and rabbits down. Sad, but in the wilderness, animals seldom live long enough to die by age, unlike in our modern society. Compared to Sweden, the quality of the water in Spain is generally of lower quality, although I believe it has improved during the last 15 years, mainly to higher awareness of the environment. And on the Azahar coast the water is particularly hard (high content of lime) and treated with chlorine, the former creating problems with the household appliances (like the dishwasher and the laundry machine) and the latter provoking a bad taste, making it unsuitable to drink. Water is essential for most turtles. Supertortuga occasionally also enjoys a cold beer, though. Supertortuga lives in an area with a relatively acceptable quality of the water, and we have limited problem with high lime content. However, while it is good enough to make coffee, wash our teeth and cook, we do not use it as drinking water. That is, until we installed our reverse osmosis filter. From wikipedia we read that "Reverse osmosis is a water purification technology that uses a semipermeable membrane to remove ions, molecules, and larger particles from drinking water. In reverse osmosis, an applied pressure is used to overcome osmotic pressure, a colligative property, that is driven by chemical potential differences of the solvent, a thermodynamic parameter." Håkan Nesser is a Swedish novelist, who, apart from several standalone novels, is famous for his series of novels about the police inspectors Van Veeteren and Barbarotti (in two separate series of novels). In my favourite series about Van Veeteren, a lot of the story circles around the police inspector himself and his personal life, as well as around the seconday characters, which in some of the novels take on a lead role. However, the first Nesser novel I read was "A summer with Kim Novak", which was a pleasant surprise for me, still being one of my favourite novels and probably my favourite Nesser novel. It is always a joy to read Nesser - he truly masters the Swedish language in a very subtle way. Mi hometown is so small that you have to make a reservation to place the car in the parking spot.